The most modern lenses are fully automatic. They focus and set the aperture all by themselves and they do it quickly and with pretty good accuracy. When making a movie, nothing is quick and there is time to carefully consider the lens choice, as well as, adjust the settings by hand. In the photo are five of the six lenses we have available. Moving from left to right, the first lens is a Zeiss 28mm lens. It is sitting on an adapter that allows it to be attached to the E mount of the Sony camera. This lens is fully manual. Its lens design produces very sharp images, with a shallow depth of field and vivid colors. The gear ring is for the follow focus mechanism and this lens is best used on a tripod. The next lens is a fully automatic Sony 35mm lens in the Sony camera’s native E mount. This lens also provides electronic image stabilization and is good for hand held and car mounted shots. Lens three is a 19mm, fully automatic, E mount lens from Sigma. This is very wide angle and, even though not image stabilized, is good for fast moving, hand held shots. 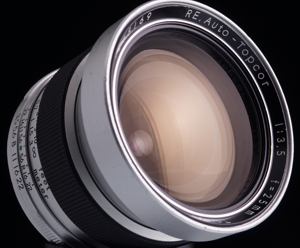 Fourth is an very old 58mm Auto-Topcor lens from Topcon. It is sitting on an adapter and has a gear ring. It was one of the finest lenses available in the 1960’s. It produces lush images, has very shallow depth of field and is good for close-ups. Lens five is another Auto-Topcor. This one is 25mm and it has a huge glass area that creates beautiful images. Both Auto-Topcors are fully manual lenses. The sixth lens (not pictured) is the fully automatic, image stabilized, zoom lens that came with the Sony camera. It is best used for ENG shoots where convenience is paramount. I have a 6 foot camera crane (or jib… not quite sure of which term to use here). 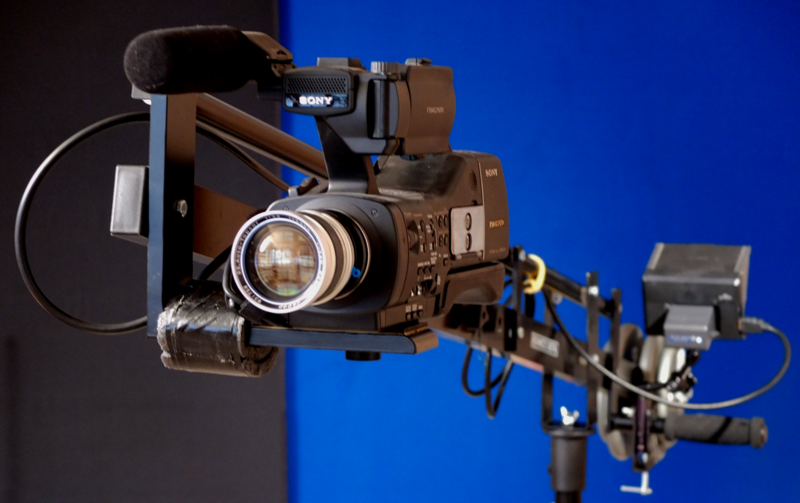 The photo shows the crane with the Sony camera mounted at one end and a monitor and counter weights down at the other end. The lens was made by Topcor over 50 years ago. My father used it with his full frame, 35mm SLR still camera. It’s mounted on the Sony camera via an adapter. I set up a small test still life and shot a few test shots. The best of the bunch is presented below. The camera was 21 inches from the subjects, the aperture was f5 and shutter speed 1/60th of a second. It appears that the camera is moving straight up and down. That’s the benefit of a crane; the camera is not still and panning but is actually following the subjects. At this close range there is an interesting circular swaying at the camera end of the crane. I could not eliminate it. I used the same crane for a few shots in Nudged and that swaying was not apparent. Those shots were of objects farther away and entailed bigger movements of the crane, so the swaying was not obvious.